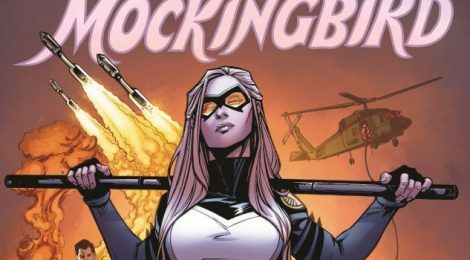 Comic Book Review - Mockingbird, Volume 1: I Can Explain - Honk if you love justice! We’ve been over the controversy regarding the series and how much of a jerk some of comics fandom can be, but I really want to talk about the Mockingbird comic, too. IT’S GREAT. Snarky, action-filled, mysterious, fun. Bobbi herself gets to shine – it’s not often she does, having been used quite often in the “Hawkeye’s wife/ex-wife” role – and the humor is on point. The story covers Bobbi (Genius Scientist Spy Martial Artist) developing some weird powers…or is she? In the course of her investigation she ends up rescuing both Lance Hunter and Clint Barton, runs into Howard the Duck and Miles Morales, and has to deal with zombies, corgis, and the Queen of England. She might smash a patriarchy or three along the way. Chelsea Cain writes Bobbi with a singular voice, and the art from Kate Niemczyk (with Rachelle Rosenberg colors) is fun. Mockingbird is tall and buff and gorgeous. There are tons of little details to pick out of the background, things that make sense or inform the story or just provoke a laugh. The middle issues can be read in any order, and I suggest reading multiple times to get everything. If any of this sounds like you, check out Mockingbird Volume 1.